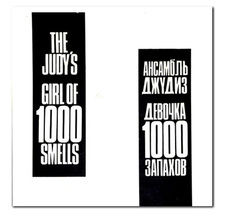 “Girl of 1000 Smells” was released as a limited edition 7” single with the song sung in English on one side and Russian on the other. Pressed in white vinyl and packaged in a scented box, the record included a booklet entitled A Guide to Good Odors. The band’s lineup at this time included drummer Matt McCarthy and later saxophonist/keyboardist Scott Krchnak, and dancer Vanita Esphahanian.